Michel (Martin Lassalle) is unable to keep a job and feels that all the positions that his friend Jacques (Pierre Leymarie) manages to set up for him are beneath a man of his intelligence. He needs to live however and, believing that society owes him, and resorts to stealing people’s wallets. Initially he is not very good but, falling in with a group of thieves and getting lessons from an experienced pickpocket, Michel moves from the random pickings of the Paris underground to elaborate operations on banks and train stations. More than just making money however, Michel feels an elation at asserting his superiority over other people and being beyond the law. But the thrill of evading the police is not enough – Michel needs to actively challenge the police to catch him, meeting a police detective (Jean Pelegri) in a bar and expounding his theories that certain gifted and intelligent people should be free to disobey laws that are restrictive on their freedom of expression and their abilities. • Commentary - this audio commentary featuring James Quandt, senior programmer at TIFF Cinematheque and editor of Robert Bresson, was recorded exclusively for Criterion in 2005. 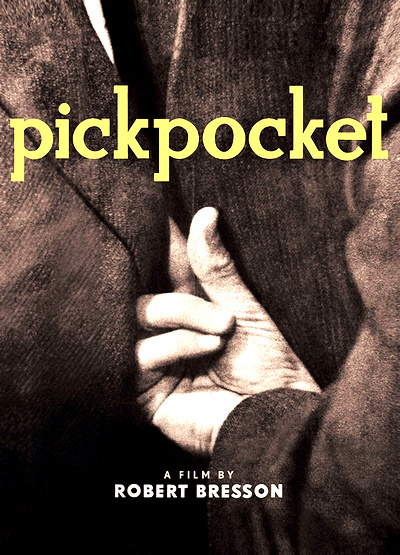 • Introduction - writer-director Paul Schrader (American Gigolo, Cat People) introduces Pickpocket and quickly explains why it became such an influential film. The introduction was recorded exclusively for Criterion in 2004. (Please note that the introduction contains spoilers). In English, not subtitled. (15 min, 1080i). • The Models of "Pickpocket" - presented here is a documentary film produced by filmmaker Babette Mangolte (Four Pieces by Morris) in 2003. In it three of the actors from Pickpocket recall their collaboration with director Robert Bresson, including the casting process, and discuss the characters they played. The final segment is particularly interesting as Babette Mangolte travels to Santa Rosa, Mexico, to meet Martin LaSalle, who discusses in great detail the "Bressonian experience". In French, with optional English subtitles. (53 min, 1080i). • Cinepanorama - presented here is a 1960 episode of the French television program Cinepanorama in which Robert Bresson discusses Pickpocket with France Roche and Francois Chalais. The French director notes that he'd rather have people feel a film before understanding it. In French, with optional English subtitles. (7 min, 1080i). • Q&A - this Q&A session was filmed after a screening of Pickpocket at the Reflet Mdicis cinema in Paris in 2000. Actor Marika Green and filmmakers Paul Vecchiali (Once More) and Jean-Pierre Ameris (Bad Company) quickly explain why Pickpocket is a magical film and discuss Robert Bresson's directing style (some of the best comments address the French director's his framing preferences). In French, with optional English subtitles. (13 min, 1080i). • Kassagi - presented here is an archival clip from the show La piste aux etoiles featuring Kassagi, a remarkable sleight-of-hand artist who shows off his skills in front of a large audience. Kassagi was a pickpocket consultant to director Robert Bresson and played the master thief Michel meets on the Paris Metro. In French, with optional English subtitles. (12 min, 1080i). • Trailer - original theatrical trailer for Pickpocket. In French, with optional English subtitles. (3 min, 1080i).